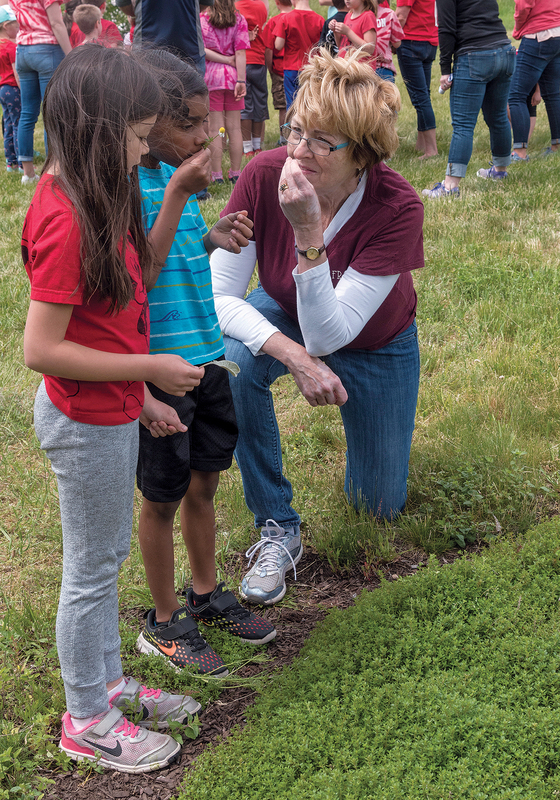 Every Monday and Thursday Julie Guerin travels the 2 miles from her home in Cumberland to the 65-acre Historic Metcalf-Franklin Farm, where she helps educate community members about sustainable gardening and tends to a garden plot she rents with a fellow member. For Guerin, a town resident for more than 30 years, gardening has been a lifelong hobby. She’s designed an herb garden featuring commonplace plants used for medicinal and culinary purposes in the Colonial era to show farm visitors how plants remain relevant and how easy they are to grow in whatever space is available. “Anybody can grow a few herbs in a pot on your deck and by your front door,” she said. She’s especially proud of the nonprofit farm’s annual average donation of 16,044 pounds of fresh fruits and vegetables to the Rhode Island Community Food Bank. “Knowing you’re part of an organization that’s making life better for others” is rewarding, she said. For the food bank, such contributions are crucial in the ongoing fight against hunger, especially in the summer, when demand increases at the same time community giving dips. The cycle is kicked off each year when students go on vacation. Every school day, explained food bank CEO Andrew Schiff, 82,000 meals – 54,000 free or reduced-priced lunches and 28,000 free breakfasts – are provided to low-income children across the state. When those services are paused during school vacations, he said, affording food “becomes an additional burden” for “low-income families straining to pay rent [and] the utility bill,” leading to an increased reliance on emergency food pantries fed by the food bank. The food bank appeals to the public for support each summer, but such pleas often fall on deaf ears because philanthropy isn’t top of mind during beach season, said Schiff. He says community groups, however, are doing plenty to help year-round. The food bank’s corporate donors have remained relatively stable. 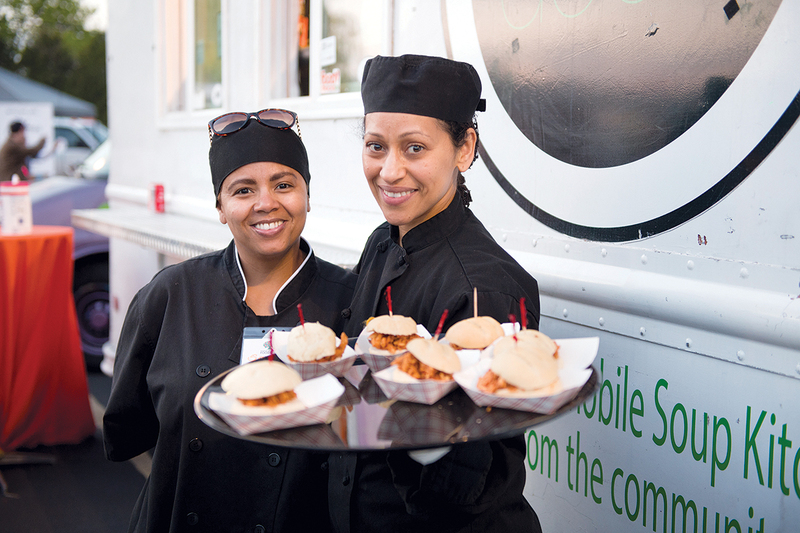 In 2012 there were 278 corporate donors – giving either cash or food. In 2015 the number dipped to 251, but last year it jumped to 289. “I’m continually impressed by the generosity of businesses in Rhode Island,” he said. What would really ease the summer burden, he says, is for the state to double its annual $175,000 contribution (Massachusetts this year contributed $17 million to its food banks). “We would use the additional state money to be able to meet this high demand in the summer,” said Schiff. The House-passed fiscal 2018 budget, however, continues the state’s $175,000 commitment. Unless that support grows, the burden will remain on Schiff and the food bank’s army of supporters for another year to come up with new ways to raise money and food donations. According to R.I. Department of Human Services data, Rhode Islanders steadily became more reliant on Supplemental Nutrition Assistance Program benefits in the decade following the Great Recession. An average of 76,315 Rhode Islanders accessed SNAP benefits per month in fiscal 2007. By 2013 that number had grown to 179,925 per month. In fiscal 2016, the monthly number was 171,037. Between fiscal years 2011 and 2016 – the most recent available from R.I. Department of Human Services – total SNAP benefit dollars spent by Rhode Islanders increased from $271.3 million in 2011, to $303.7 million in 2013 and $273.7 million in 2016. Schiff said the food bank served 33,000 people monthly via food pantries prior to 2007, a total that more than doubled to 68,000 in 2007. Today, the food bank serves 59,000 people each month. “It’s down somewhat … but there’s still a very, very high need,” he said. The food bank aims to distribute 10 million pounds of food to its 160 member agencies each year. Because food donations have historically totaled approximately 7 million pounds annually, the food bank expects to purchase the remaining 3 million pounds to meet the need. However, the food bank hasn’t hit that food-distribution goal in four years. As food donations fall and the price of food rises, the organization must commit more resources to fundraising. In fiscal 2014 the food bank distributed 9.9 million pounds of food. The following fiscal year it was 9.7 million pounds. In fiscal 2016 that fell to 9.2 million pounds, before rebounding slightly last fiscal year to 9.5 million pounds. Food donations are more prevalent in the fall and winter, coinciding with the holiday season, explained Schiff. That leaves a lot of the purchasing to the summer months, drawing resources from the rest of the year. 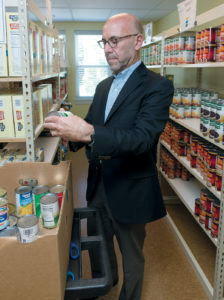 And because the price of food is also rising, each year more money must be raised from the community just to purchase the same amount of food as in previous years, said Schiff, describing the food bank’s biggest challenge. “With donations from the public, you have to try to inspire thousands of people to give to your organization,” he said. The value of food donations has declined steadily from $10 million in fiscal 2014 to $7.4 million in fiscal 2016. 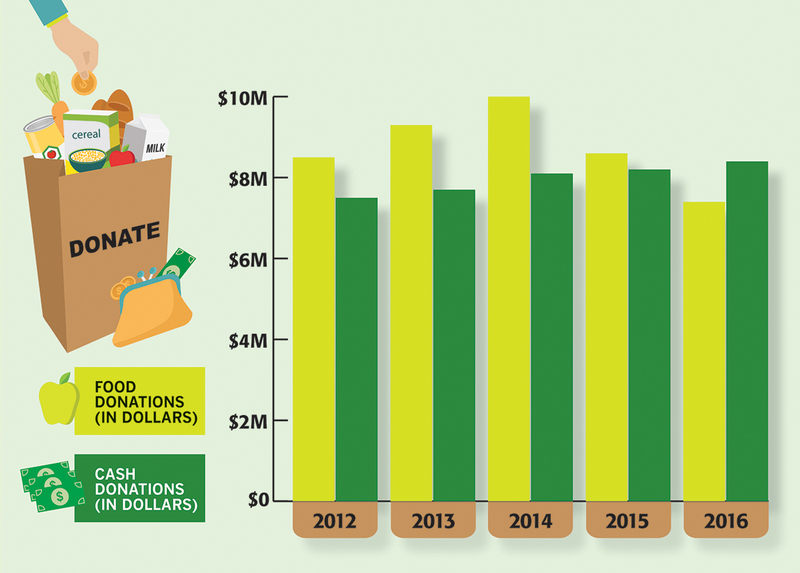 Cash donations, meanwhile, have slowly risen, from $7.5 million in fiscal 2012 to $8.4 million in fiscal 2016 – but not enough to offset the decline in food donations. While the problem “isn’t anything unique to Rhode Island,” according to Schiff, that doesn’t make it any easier to find ways to deal with it. 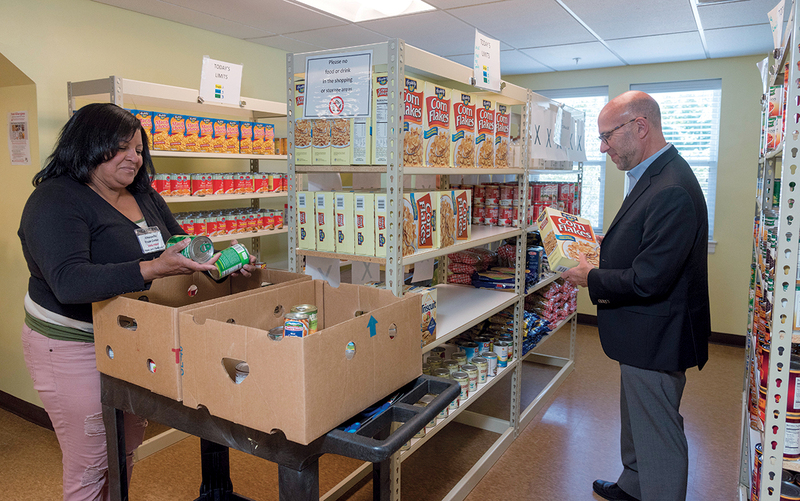 In his 10 years at the food bank, Schiff said grocer technology has improved to the point companies track their inventory so well that donations of excess food to local food banks have decreased and will continue to fall. The food bank’s top donor is Stop & Shop, which has donated nearly $1.4 million (including sponsorships) and 2.8 million pounds of food over the past five years. The supermarket chain’s contributions to the food bank stretch back three decades. “Hunger doesn’t take a summer vacation; the need is constant,” said Phil Tracey, spokesman for the New England division of Stop & Shop. From March to April the grocer collects donations for Hunger Boxes – parcels with staples like potatoes, rice, soup and corn – which arrive at the food bank by the beginning of summer. But can corporate sponsors such as Stop & Shop and community groups do even more than they already are to help fill the summer gap? Tracey would like to see increased corporate donations across the board – monetarily, collecting products and volunteering – to help the food bank’s effort. “There is always a need and you can never have enough,” he said. Brown University’s newly formed finance division recently joined the food bank’s list of volunteers. Doreen B. Burgers, Brown’s director of administrative services and outreach, set up the experience assembling summertime meal packs for children. She said the group was looking to “engage with the broader community in a hands-on, meaningful way.” They ultimately chose the food bank because “we knew when we arrived we would have a job. Julie Hershkowitz, the Pawtucket Red Sox director of client services, said the team uses its summer advantage in reaching out to large groups of people to support the food bank. PawSox support comes in three categories: education, in-kind donations and monetary contributions. Armed with food-bank statistics, the PawSox call attention to the demand by appealing for specific food items, said Hershkowitz – herself a food-bank volunteer. It’s paramount to “educate folks that the need doesn’t stop because the weather gets nice,” she said. One of the most successful PawSox summertime fundraising initiatives is Strike Out Hunger, a partnership with Citizens Bank. For each strikeout, Citizens Bank donates $60 to the food bank, which can then purchase 150 meals. Over the past decade, Strike Out Hunger has led to a total $800,000 in donations from Citizens Bank to the food bank, said Barbara Cottam, Citizens Bank’s Rhode Island market executive. But even some longtime supporters of the food bank are unaware of just how much help it needs in the fight against hunger. Pamela L. Thurlow, president of the Historic Metcalf-Franklin Farm Preservation Association’s 65-acre farm, said it was “disheartening” to hear about the food bank’s struggle to meet summertime ­demand. She plans to use social media to help spread the word. But she’ll also continue working to harvest and donate more vegetables too, knowing the social media campaign isn’t “a magic-bullet” solution. Much of the farm’s land was purchased by Cumberland in 1994, with another 2.5 acres bought in 2005. Two years later, the organization started donating to the food bank. 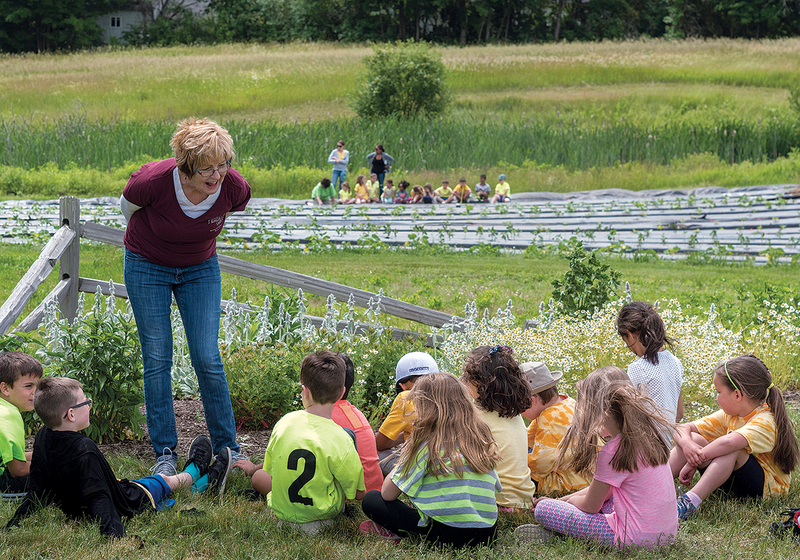 In addition to fresh, organically grown vegetables, Thurlow said volunteers teach everyone from first-graders to the elderly the benefits of sustainable farming through its programs and events. One major form of outreach is when up to 50 volunteers tend crops twice a week. The farm also rents garden plots to local residents. Currently, there are about 30 families renting plots on the farm. The land is side-by-side with 1.5 acres used to grow produce donated to the food bank. While such programs help attack hunger through both direct contributions and curbing demand by boosting food production, Schiff, while appreciative, says more help is needed. He said the food bank benefits most when donations are uniform and part of a business plan. “When food donations become not just something done out of the goodness of a heart but as a regular part of a business model … part of a [supermarket or farmer’s everyday work] … that’s when it works the best,” he said. More government funding, which accounts for just 2 percent of the food bank’s annual revenue, would also help ease the burden. Schiff lobbies each year for more state funding, which he says once totaled $350,000. Each year at Thanksgiving since 2007, he’s sent a status report outlining demand for food assistance and the need for donations to every Rhode Island state senator and representative, he says. “Advocacy hasn’t brought additional money,” he acknowledged, though he thinks it helped convince lawmakers to continue providing some funding after they ended a controversial community-service grant program last year. FOOD AND CASH DONATIONS TO THE R.I. COMMUNITY FOOD BANK According to food-bank data, a dip in food donations, mirroring national trends, has not been offset by steady increases of cash donations over the past five years. The food bank, which records both food donations and cash donations in terms of monetary value, saw an average $8.76 million in food donations per year and $7.98 million in cash donations per year since 2012. For every donated dollar, the food bank says it can purchase 3 pounds of food. If doubled to the $350,000 the state last provided about a decade ago, that contribution would be responsible for one-tenth of the food needed to meet the food bank’s annual goal, Schiff said. “That would be a tremendous help,” he added. Each year state representatives participate in the “Legislative Leap” – an event that raises money and awareness for issues plaguing Rhode Islanders. Their method of communication? Skydiving. In 2015, three-time participant Rep. Robert A. Nardolillo, R-Coventry, and seven colleagues jumped in support of the food bank, raising nearly $2,000. Nardolillo said he is “in full support” of doubling the food bank’s state funding, to 2007 levels. He called the request “practical,” while admitting he doesn’t know why lawmakers aren’t committing more. Like Nardolillo, fellow 2015 skydiver Rep. John G. Edwards, D-Portsmouth, could not recall seeing Schiff’s annual reports. Calling for more donations from individuals and corporations, he said, “I don’t think you’ll ever really get rid of hunger, but you’ll take a pretty good chunk out of it with a concerted effort” from donors of all types.